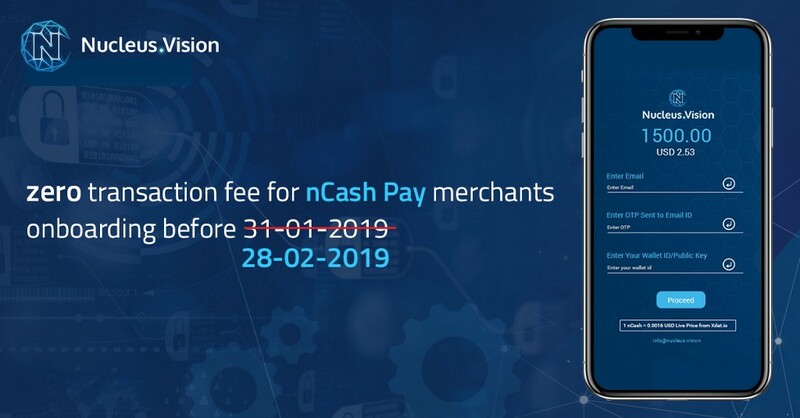 We are happy to announce the extension of our new year launch offer on nCash Pay for one more month. Since its launch, we have been overwhelmed by the response from the extended community and there has been a lot of demand to extend this offer. We had initially wanted to only pilot this campaign with 5 merchants, given our stringent KYC and legal processes. But the number of eligible businesses which applied have been far more than what we expected and as a result, we are accepting more merchants into the nCash Pay programme. With community access to over 100,000 people across the world, nCash Pay offers a huge base of customers to any business, along with a seamless and robust payment solution. FLOGmall from Russia and StarFeed from Korea are already benefiting from integrating nCash Pay and we will be announcing 3 more retailers in the coming weeks. Disclaimer: This is not an investment advice. Please do your own research before investing in any avenue. The information contained in this post is for informational purposes only. You should take independent advice from a professional or independently research and verify, any information that you find in this post and wish to rely on, for the purpose of making any decision. Through this post, you may be able to link to other websites which are not under the control of Nucleus Vision. We have no control over nature, content, and activity on those sites. The inclusion of any links does not imply a recommendation or endorsement of the other website, its products or views.